We’ve been busy this past week adding a whole bunch of smaller features and new assets to the game. Bandits are now available for you to fight in tactical combat – our first opposing faction that consists almost entirely of humans. Also, militia is now desperately defending their homes in tactical combat as well. But that’s not all. The first almost entirely human enemy faction is now in the game to cause mischief and terrorize the poor civilians until they cry out for help to the Battle Brothers. The Bandit faction consists of society’s dropouts, reckless outlaws, desperate refugees, wanted criminals and all those that want to make a quick crown by taking what is not theirs. They usually hide somewhere in the woods, be it abandoned huts, old ruins or makeshift encampments. When they head out they look for trade caravans und unaware travellers to rob them of their belongings. If they’re strong enough, they may even raid whole villages for valuables, supplies and prisoners. In combat they have access to the same equipment, weapons and perks that Battle Brothers do, so be prepared for a match at eye-level. They usually rally behind an exceptionally strong, skilled or brutal leader and have some really experienced archers in their ranks. Their melee combatants range from poorly armed and malnourished thugs to battle-hardened raiders. Bandits will usually be among the first enemies you encounter on the worldmap as they tend to stick close to settlements and trade roads. Militia is the makeshift fighting force of civilian settlements like villages and cities. These are basically citizens that arm themselves with whatever weapons and tools available to them as soon as danger approaches. That is why they will only show up on the worldmap when there is an enemy party closing in on a settlement. As these are not professional soldiers they lack in equipment and experience compared to other forces – but do not underestimate their determination to defend their homes and their loved ones against whatever enemy. In combat, militia are usually led by an experienced militia captain, perhaps a professional soldier or sellsword when he was younger, that coordinates all the fighters and distributes weapons and armor among them. The militia captain boosts the morale of all others by some margin, and if he falls, it can spell disaster. 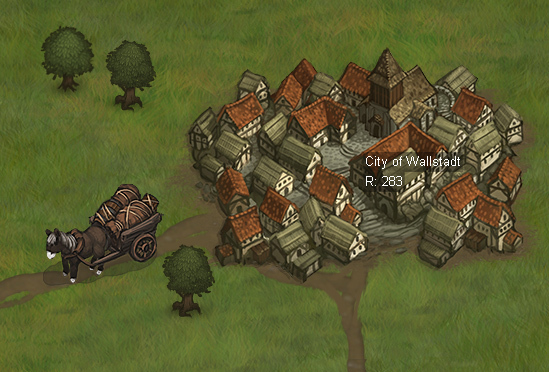 Besides the small villages we’ve shown before, we’ve now implemented cities into the game. The city is a civilian settlement like the village and has a militia force defending it. However, the city is much bigger and presents better opportunities for a mercenary commander. More potential recruits are available for hiring, more and different contracts are on offer, and a larger variety of weapons, armor and supplies can be found. 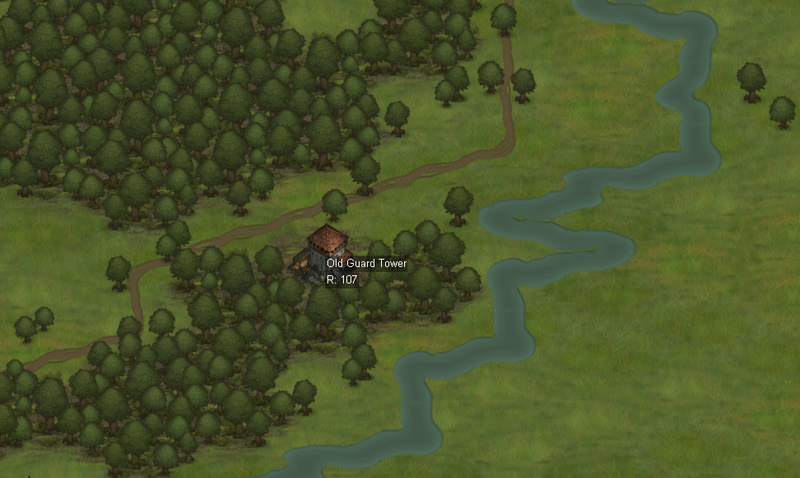 As prices in general tend to be higher in larger settlements, everything may be a little more expensive here, though. Cities are important hubs for trading caravans and for your mercenary company to restock supplies. Speaking of trading caravans, we’ve replaced our placeholder caravan with an actual asset of a little wagon pulled by a donkey also pictured above. 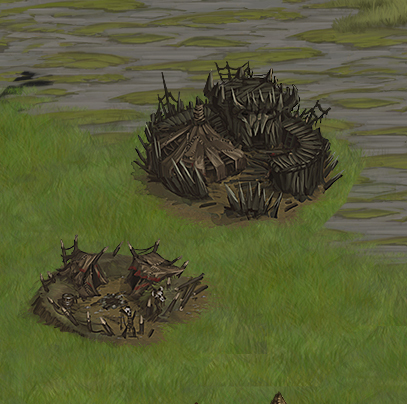 Also, the orc faction got new assets for their hideout and warcamp – finally they won’t have to share the sprite with the bandits anymore and have a style of their own. Mercenaries are a needy bunch. You need to feed them so that they don’t starve or desert you, their armor needs repair after battle and their quivers need to be refilled. The supplies necessary for this can now be bought at allied locations – villages, cities, watchtowers and strongholds. Of course, food is more readily available at villages that live off of farming, and tools to repair armor with are easier to find at a military stronghold or larger city than at a small and peaceful village. These supplies can also be looted after combat, both from locations you raided and from enemy parties you engaged. What supplies exactly and how many depends on what your opponent was doing. An orc or bandit hunting party will have more food for you to loot than a scouting party does – the more, the longer they’ve been out and hunting animals, in fact. How exactly does repairing and healing work? Healing and repairing is done automatically on the worldmap but requires resources – tools and armor parts for repairs, medicinal supplies like bandages and herbs for healing – as well as time. We went that route in order to avoid burdening the player with too much micromanagement when repairing the helmets, armor and shields of a dozen people after every battle. The idea is to expand on this mechanic in the future with, for example, a smith that can be hired for quicker and more cost-effective repairs, or a healer tending to your wounded and helping them recover. Wow, such kind of healing is cool. I thought that here as always would be autoheal/regeneration during some time, but that is much better, I like it :) . And those orc hideout looks really great! And how your deals with your team? Have you found new interface programmer? And one more question. How can I distnguish where are the bandits and where are mine warriors? I noticed that militia have some bandages. Your Battle Brothers should be relatively easy to distinguish from bandits. For one thing, your people always look to the right (unless you flip the map) and your opponents look to the left. Battle Brothers have a socket made of stone whereas bandits have one made of dark wood pictured above. 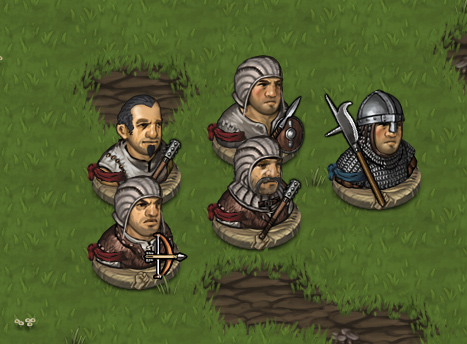 Although Battle Brothers and bandits share faces and equipment, bandits also have a subtle dirt layer for that scruffy look, and their armor is rendered slightly darker and desaturated in order for them to stand out a bit. Darkest Dungeon just went into Early Access and I am loving it, but my enthusiasm for Battle Brothers has not diminished one iota. Everything you post about this game just confirms that you appear to be building my dream game. Thanks for keeping us apprised of each (awesome) development. I am looking forward to spreading the word far and wide when the time comes! Thanks Jason, always great to get some support and be reassured that we are on the right track! Looking forward to DD myself but saw some videos and I am a bit concerned with the RNG that can mess up your whole dungeon run (AOE-Crits anyone?) – but good thing: This makes us more aware of checking our game for the RNG as well because we do not want to punish the player by random luck too much. That just leads to people reloading. 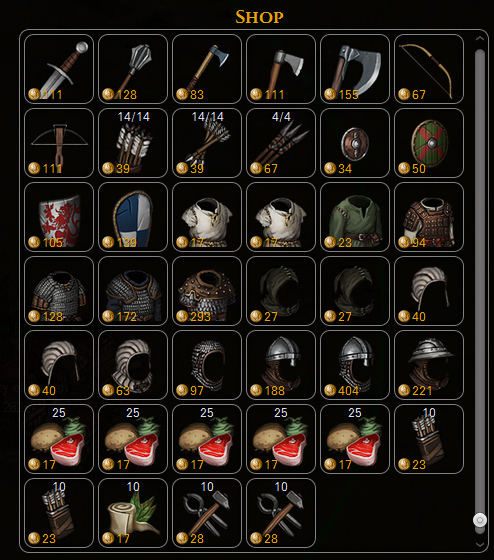 This all looks great, but about armor mending: I agree in principle about automating some of this stuff, but are you going to auto-mend ALL the armor in the player’s inventory, or just the armor currently worn? What happens if you don’t have enough parts to mend everything? The player might prioritize mending his tank’s armor over his archer’s for instance. Also, will your units heal slowly over time, even if you’re out of bandages/herbs/whatever for treatment? Armor worn by characters is currently prioritized if there is a shortage of supplies. I agree that we should add some manual levers and switches for prioritizing armor of particular characters, as you pointed out. There is still a lot of potential for finetuning this and we’re not at all done with it. Characters currently don’t heal at all without at least a bandage or so, but their condition also doesn’t deteriorate. This may change in the future, especially as we add more detailed injuries and scars, both physical and psychological, that characters can receive in battle. I love games with overland maps and strategic management. Your concept is great. I would like to assign healing/repairing in the way I want, not automatically. Perhaps I prefer to heal a frontline tank soldier instead of heal a backline archer, etc. It would be nice that you could put the option of manual/automatic healing/repairing. It would be great to see the game having the “campfire” feature in order to perform rest/heal/repairing tasks. We definitely have to give the repair/heal mechanics some more love. They are in the game and working ok as is but there is a lot of room for improvement.